Every building is sitting on an almost limitless supply of energy that is often overlooked because of the mystery that surrounds how it’s used. How is it possible to achieve comfortable heat from soil that is consistently only 50 – 60 degrees throughout the year? This energy source, known as geothermal or earth energy, is available year round, day and night and is just waiting to be tapped into. 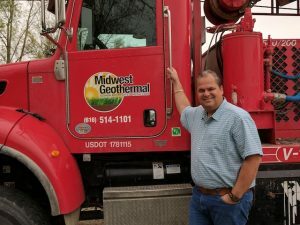 In order to help dispel some of the mystery attached to geothermal, Scott Skoog, President of Midwest Geothermal, was interviewed and his thoughts are shared below. Skoog’s insights create a very compelling case for the use of geothermal energy for heating as well as cooling any building! What is the one thing you wish more people understood about geothermal? Quite honestly – the basics! We’d love to have the general public understand that geothermal isn’t a new technology, and although we aren’t the sexiest renewable, we are the most effective and consistent. The upfront cost of geothermal as a renewable source of energy is still one of the lower cost renewable energy options. And the operational costs are constant – your utility bills won’t continue to go up because the ground temperature doesn’t change. We can rely on the constant nature of the earth’s heat to provide stable energy costs for a customer through the use of buried liquid containing pipes and a pump that transports and concentrates the transferred heat. What are the most significant energy challenges geothermal overcomes? Geothermal, as a technology, can overcome several significant challenges building owner’s face. A geothermal system, once installed, is virtually maintenance free. Most customers see a dramatic decrease in costs associated with HVAC maintenance when converting to a geothermal system. On top of reduced maintenance, geothermal provides more consistent comfort. Because of the nature of the system, it actually performs more efficiently if the thermostat is set at a comfortable temperature around the clock instead of the setbacks that we see with traditional systems. Also, with more frequent air changes, indoor air quality is improved and the “hot and cold” spots from the shorter run times of conventional equipment are eliminated. Plus the onsite nature of geothermal supports the construction of buildings in locations that can’t access the infrastructure required to pipe in or transport traditional energy supplies. A dependable source of energy is possible in areas that would have been considered “off grid” before. Can a geothermal system be used in retrofits or only on new construction? A geothermal system can absolutely be installed in retrofits as easily as new construction. The geothermal heat pump is generally the same size as conventional HVAC equipment and can use the existing ductwork of a building. In large commercial settings a geothermal field can be used as a heat source or a heat sink in lieu of large conventional equipment (cooling towers, boilers, chillers) and be placed under open spaces that are already in use (parking lots, athletic fields, etc.). With a geothermal ground source heat pump, because it’s a buried system, the location of the field is really just dependent on the property where it’s being installed. What is the greatest benefit of a geothermal system? This question can be answered with one word – consistency. 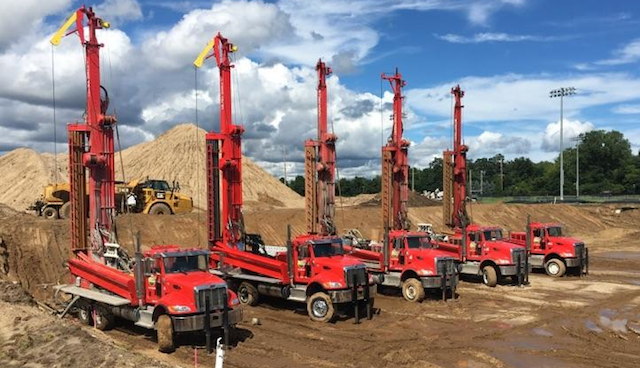 Consistently low operating costs and consistently dependable operating temperatures. As I mentioned earlier, geothermal overcomes so many challenges while providing some of the greatest benefits to a building owner. The loop fields required to tap into ground heat carry a guarantee from the manufacturer for 50 years, leading to an economic life of over 100 years. The equipment, because of the consistent nature of the water used in the equipment, can last 20+ years without the loss of efficiency. Many clients choose a geothermal system because they want the benefit of a sustainable, dependable, zero emission energy solution for their heating and cooling needs. The days of burning fuel inside our homes or places of business are eventually going to be thought of as archaic. What financing options are available that make adopting geothermal affordable? Currently, there are several avenues for financing and incentives. Commercially, the most attractive financing program available is probably the PACE program. This program allows the building owner to invest in their property without taking on a personal financial liability. Instead it allows the building operation to pay for the cost of the investment through energy savings. There is a bill right now in the Ways and Means Committee that also provides federal tax incentives. Currently there are almost 60 co-sponsors of this bill and gaining more every day. What is biggest barrier to adopting the geo-thermal technology? Education! Generally speaking people don’t understand the huge benefits of geothermal nor do they understand in general how it works. Because it’s not a renewable energy source that people can “see” it’s hard to visualize or understand! A building owner doesn’t show off their “geo field” like they would a wind turbine or solar panel. With a concentrated effort to educate the public and decision makers on how the technology works, along with it’s benefits, I expect to see geothermal take off as the “go to” for renewable energy solutions. The second barrier is overcoming any bad press. Because geothermal isn’t widely known, there is always the possibility of bad installations spoiling those that may be looking at it. I have found that using organizations like the International Ground Source Heat Pump Association (IGSHPA) to educate installers and provide a set of standards for installers and inspectors alike, we can combat this problem with good education. It is critical to utilize certified designers and accredited installers for every application. What is the efficiency compared to conventional systems? We think of conventional equipment as high efficiency when it is 97% or 98% efficient. When taking into account the renewable energy aspect of a geothermal system, we see as much as a 350% efficiency. Pretty exciting investment! The efficiency in geothermal versus traditional equipment (boilers, cooling towers, chillers, dry coolers, etc.) is that there is very little maintenance required for a geothermal system. The fluid in a geothermal system, depending on the design factors, can be a stable, maintenance free fluid for years and years. This fluid, traditionally water or an environmentally friendly propylene glycol, really only requires a quality check every few years, and can be checked by a water treatment contractor, whereas a boiler has to be checked by a licensed boiler technician, and a cooling tower or other chilled water source is very dependent on precise water quality standards as well as having more moving parts to be maintained by an HVAC technician. The Energy Alliance Group of Michigan utilizes a comprehensive approach whenever geothermal is added to a project. The comprehensive approach involves bringing together multiple elements (financing, rebates, tax credits, technology etc.) that can make the many benefits of adopting renewable energy affordable. The best time to consider converting a building to geothermal is when rising energy costs are a concern, the frequency of HVAC maintenance is on the rise, and when the present heating and cooling equipment is nearing the end of its expected service life. Many thanks to Scott Skoog and Midwest Geothermal for an impressive update on geothermal energy. See also – Free Report: Ten Questions to Ask BEFORE An Energy Efficiency Upgrade.